Based in Benicia, California, Yandell Truckaway, Inc. offers warehousing, specializing in temperature-controlled, bonded wine storage. Cross-dock services are also available to consolidate freight on the West Coast and maximize customer satisfaction, while managing decreased shipping costs. Repacking capabilities are case-to-case and bulk-to-case, as well as relabeling, gift packs, and "club store" packaging. SC Warehouses, Inc. offers pick and pack services for all of your fulfillment needs. From wine shipments to gift baskets, SC Warehouses, Inc. can accomplish your dynamic marketing needs. The American Canyon warehouse is 250,000 square feet, with 24 loading doors and 5 railcar doors. The Benicia location is more than 500,000 square feet, and is conveniently located near the Port of Oakland, BNSF, and UP, making it ideal for dry goods. The operations are set up for palletized distribution and repacking/sorting to optimize space and minimize damage. 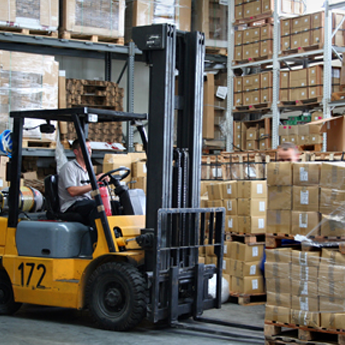 Our experienced clamp lift and forklift operators can handle almost any size, shape, or weight of pallets. Inventories are stocked using a concise system to make location easy, and rotated on a first-in-first-out basis (unless otherwise requested). We can easily track lot numbers, pallet ID numbers, or any other reference that is conducive to your present inventory configuration. As a food-grade storage facility, we are registered with the State of California's Department of Public Health Food and Drug Branch. We are a constantly growing, diverse warehousing company that handles many different product by offering many different solutions for your unique commodities. You'll get reselection for glass and plastic bottles to eliminate bad products, lot numbers, or defects. Our staff has been specially trained by GPI and AGR institutes, and is familiar with cosmetic and integral glass defects. We also recondition damaged products and repackage bottles into any box with multiple box assembly machines. Our versatile staff is equipped to handle the repackaging of various commodities, including food, beverage, and wine products. We specialize in temperature-controlled, TTB and ABC-bonded storage for the wine and beer. However, in addition to wine-related services, we also offer food-grade dry storage to maximize production efficiencies for you.